We’ve got great news! 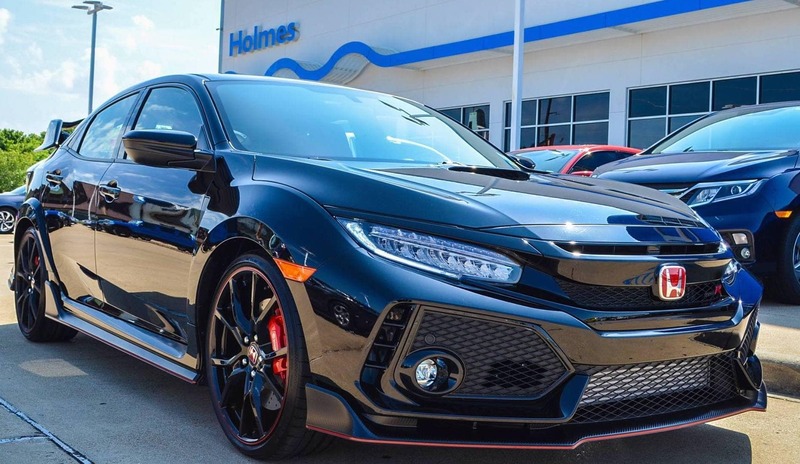 We have a beautiful 2019 Honda Civic Type R in Crystal Black Pearl coming to Holmes Honda Shreveport in March! The Honda Civic has made Car and Drivers 10Best for the second time. The Civic Type R is one of the most highly anticipated car of 2018 & 2019 as its been a long decade waiting for it to come to the U.S. legally. The Type R did not disappoint with its 306 horses with a 2.0L turbocharged engine and a full functional body making it the fastest FWD car in production. The Civic Type R caused a wave of excitement when it beat the Nurburgring lap time record, 7 mins and 4.3 beating the last record lap holder a full 5 seconds. It keeps up all to well with its AWD competitors while gouging their prices by thousands of dollars. Needless to say, you get a lot of car for the money. The Civic Type R is definitely one of Honda’s most legendary vehicles. Short-throw six speed manual only –Rev Match feature, but have the option to turn it off. The aluminum shift knob and pedal set. Weight is down slightly (-15 lbs) compared to a base 2017 Honda Civic Hatchback and down 35 lbs from 9th Gen Type R! Standard 7″ touchscreen, navigation, Apple CarPlay and Android Auto. Expecting to be around the mid 30’s! Everything on the Type R is completely functional!